Instagram is a juggernaut that businesses can no longer afford to ignore. I want to talk about how we can take advantage of it as a channel. The main reason Instagram is exploding is that it is a 100% visual platform. Image is everything. Visual data is processed 60,000X faster than text, 40% of people respond better to visual, and 65% of people are visual learners. Visual content, according to HubSpot, is 40X more likely to get shared on social media. ● In 2017, there are 71% of businesses that are using Instagram. ● There are 8 million business profiles, while last year at this time there were only 1.6 million. ● Instagram ads, by the end of this year, are going to account for 10% of Facebook’s total revenue. ● Instagram is predicted to have more net revenue than Google and Twitter. ● Instagram stories has 250 million active users — overtaking Snapchat. ● In March of this year, 120 million Instagrammers either visited a website, got directions, called, emailed or DMd a business. ● 60% of Instagram users have said that they have learned about a new product or service on the platform. Geo-Tagging: When you actually put the location in your post or story, it has 79% more engagement. Location is absolutely critical; I find that when I add a location to my post it almost doubles my views. Using the right hashtags: 70% of Instagram posts are never even seen. So if you don’t use the right hashtags, your post will get lost in the algorithm. Frequency: CoSchedule — a social media platform managing software for companies like us — has found some really interesting data on when you should post. Monday-Friday is by far the best for engagement, with Monday being the strongest day overall for engagement. They found that 3 pm is the worst time to post on Instagram — even though, historically, it is known to be the best time to send off an email. They’ve also found the three times per day that are the best times to post: 8 am, 5 pm, and 2 am; So part of it is posting when people are looking at Instagram (before and after work), but the other part of it is posting when there’s a lower frequency of posts and yours will be more likely to be seen. Scheduling tools like Hootsuite, Later, and CoSchedule can really help with this. Post Amount: CoSchedule is actually recommending you post a minimum of 1-2 posts a day, if not 3. They find if you only post once a day, it’s a little too low; If you post three times a day or more, it’s a little too high. So 2 posts a day is really the sweet spot. Videos: The other thing CoSchedule learned is that videos can do really well. If you post them at night — in the 8-9pm window — it actually gets you 34% more interaction. During the day, people only take the time to look at a quick pic — so if you want them to actually watch your video, you might want to post it at night when they are not as distracted. Instagram consumption of videos is up 40%. But, what I’ve learned is that you can still get 36% more likes on photos, so I wouldn’t go all-in on videos — though it is good from time-to-time. Content Strategy: The 80/20 rule. 80% of your stuff should be jabs; Helpful, high-level branding — and 20% should be right hooks; trying to get a lead or make a sale. I think this applies to most social media and email marketing, and definitely applies here. Instagram photos that feature faces get 38% more likes than those without a face; People are looking for other people. Also, almost 50% of captions and comments have emojis, so you can definitely use emojis on your Instagram posts. Demographic: Of Instagram users, 38% are women and 26% are men, leaving a huge gap for ‘other.’ But, if you look at that statistic, there are almost 50% more women using Instagram than men. And if you look at the age groups, 18-29 makes up 59%, 30-49 makes up 33%, and 50-65 makes up nearly 20%. I truly believe that Instagram Stories are the next news feed. The difference between a story click and a view on Facebook is totally different. You do not see an Instagram Story unless you want to — You have to click on the circle. Facebook shows us what we want to see but we don’t control what we really see. I think the reason stories are really exploding is because it is the most 100%, opt-in, permission-based marketing ever. Stories are the next news feed. If you’re an Instagram influencer and have over 10,000 followers, you can do an Instagram Story that prompts people to ‘swipe up’ to visit a page after watching. It’s also available if you pay to play. The Instagram ‘swipe up’ to a video is where we should start — your audience will see a teaser of the video in the story and then swipe up to view the whole video. The data is pretty compelling around how long they’ll stay after they swipe up. Instagram for three or four straight years didn’t have click away ads, so when they introduced them, a lot of people didn’t click them. So Instagram introduced lead ads. A lead ad is basically a pre-filled form that opens up on Instagram so the person doesn’t have to leave — This is where you can get a person’s name, phone number or email. 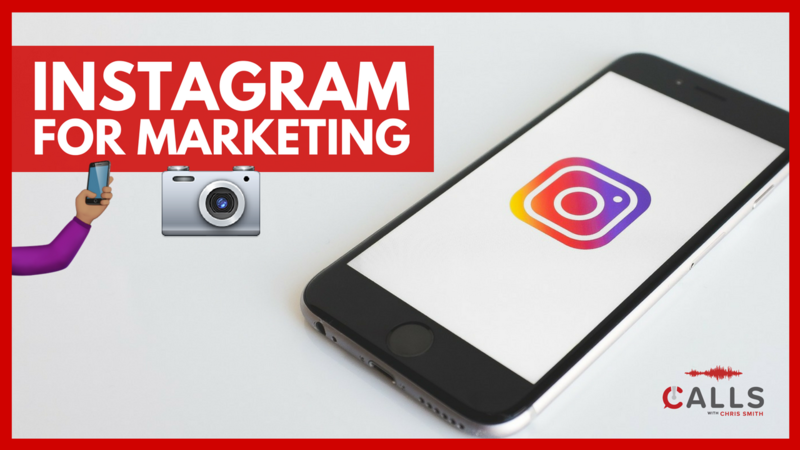 Now what you can do on Instagram is retarget people that engage with your Facebook ads, subscribe to your Youtube, or join your email list on Instagram. Instagram is exploding and we want to go from using it passively, to using it purposefully. I want everyone to be as great and smart about Instagram as they are about using Facebook — because it is the next frontier.